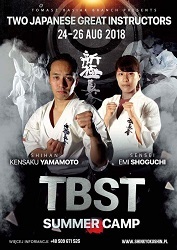 TBST Tomasz Basiak Shinkyokushinkai Team, keep great events coming. In a short time the will organize a seminar with Shihan Kumiko Sunakawa 5th Dan, 6th and 7th January 2018. This is like what was being done last year, with an seminar held by Emi Shoguchi, World Champion,Japan. The next one up on the schedule: summer camp 24th – 26th August 2018 with Kensaku Yamamoto Shihan and Emi Shoguchi Sensei! We will give you some videos to getting “warmed up” ! Some old videos, showing amazing skills and it is fair to say that the waza-ari`s, well they did not come easy! Kensaku Yamamoto. Emi Shoguchi ⇓, Winning the World Championship in Open weight and in weight categories gives us a perspective.. adding five All Japan Weight Category Tournament gold, and three All Japan Open weight Tournaments gold makes us very impressed! Videos from WKO Shinkyokushinkai official Youtube Channel visit for more..! This entry was posted in Profiles, Seminars and tagged Emi Shoguchi, haukis, shinkyokushin, shinkyokushin haukis by Steffen. Bookmark the permalink.